How to Stop Bringing Clutter into Your Life - Home Sorted! Most of us have the best intentions. We plan on getting our homes sorted and keeping clutter at bay. But then the junk mail arrives, we go grocery shopping without an action plan, or your children receive 15 new toys for their birthday. Without follow through, the best intentions can go to waste. Rather than constantly decluttering your home, we want to help you stop bringing clutter into your life. Not only will this decrease your home maintenance time, but it also has the power to declutter your mind. Sound like something you could use? Yes? Well, in that case, keep reading. If you’re not going to read it, don’t bring it inside – it’s as easy as that! When we think about clutter we often forget to consider our email clutter. If you’re anything like us, you receive a massive amount of email newsletters on any given day. Instead of moving these to the trash, take a few moments each week to hit unsubscribe. You’ll be thankful in the long run. It’s so easy to hit the shops and buy a new outfit for every occasion, but do you really need to? Try and incorporate a policy of only buying what you need – you’ll reduce clutter in your home and increase the dollars in your bank balance. It’s a win-win. Be prepared for the weeks meals by checking your pantry before doing groceries. This will allow you to plan your meals in advance and use up items you have before they expire. Kids have the uncanny ability to outgrow toys at rapid speed. Combat this by borrowing toys from a local toy library. This way they can try something new every couple of weeks and you won’t be feeling the pinch in your wallet. The same goes for books. Consider joining your local library branch and making it a family outing each month. There is no better way to encourage good reading habits than by following them yourself. 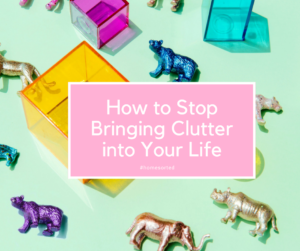 Are you ready to stop bringing clutter into your life? We sure hope so!